In case by the time you’re 34, or even 20. Or even if it’s as soon as next week. I want you to be able to remember today. 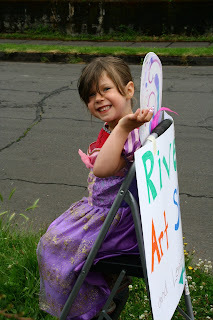 It was the first annual River’s Art Show. And it was awesome. You have been impressing people for years, YEARS, with your artistic talent. Even at age 3 you had an understanding of depth and perspective in regards to how you composed characters with your pencil, or marker, or even DoodlePro. And it’s not just that you can draw, but that every drawing has a story to go with it that’s as detailed as a full night’s dream. So to celebrate how far you’ve come at age 7, and to inspire you to keep doing it, we set you up with your own art show, scheduled to coincide with Sunday Parkways, since it would be making its way down our street and in front of our house. You were hesitant this morning, not wanting to get dressed or come outside to set up. Instead, you wanted to sit in the basement and draw. So Tim and I set up the awning in the driveway. Tim wrapped it around 3 sides with plastic sheeting, in case the 30% chance of rain became 100% true. Then he strung up yarn and clipped clothespins to it, and together we hung your sketches, your posters, your prints, and your double-sided Blasensarewen. We set up a 6 foot table and displayed your jet pack and knee-boarding monster sculpture, your painted glass and your corkboard. And we left your sketchbooks open for people to peruse. River’s Art Show. and Lemonade. FREE! Then the bicycles began to come down the street. And people would point and smile and say “Look! River’s Art Show. That’s cute.” They said that a lot. You stayed behind the 6 ft table, your sheets of paper in your lap, whipping out drawing after drawing. 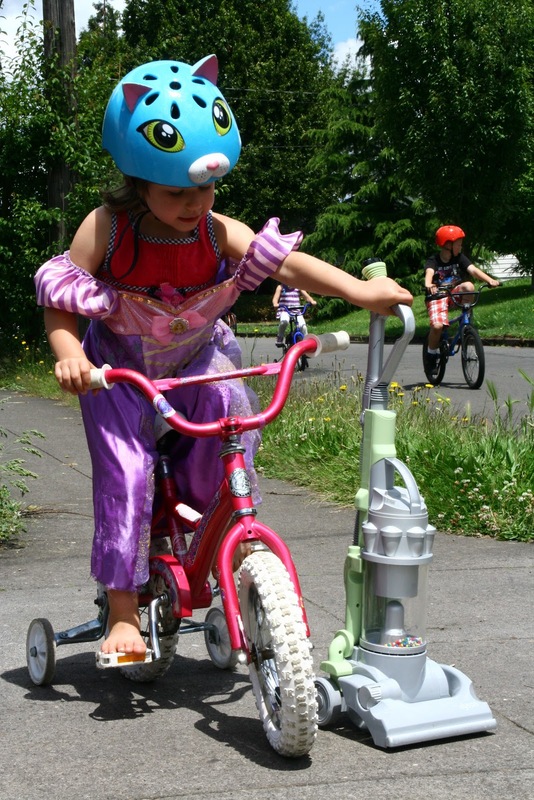 Then a group of kids slowed down by the driveway, lingered for a second, and then came on up, some still straddling their bikes under the awning, others having left them lying on their sides in the grass. They checked out your artwork, nodding and smiling, and partook of the cookies and lemonade. Then they rode off, pretty stoked. And you were stoked, too. Once upon a time a unicorn farted. The end. They’d ask questions. You’d answer them. You’d give a little tour, in a semi-clown way, trying to be a bit silly. You even got a couple of tips. Cash money, in your hand. For doing art, my boy. You wanted to make a “for sale” sign, but I dissuaded you. Not yet. This art show was to be for the sake of art itself. Then you wanted to make, and did make, a sign that said “Do Not Tuch.” With a circle and a slash through the “Tuch”. And again I dissuaded you. This was to be an art show where if someone needed to touch your framed geometric robot, they should feel okay to do so. You made friends. They hung out and started doing their own art. They made signs that said “AC/DC Shook Me All Night Long”. And posters for your show. Paige made an advertisement that said “River’s Art Show” and taped it to her bike, so people would read it as she rode around. You caught a butterfly. Though it might be a moth. Likely it's a buttermoth. It didn't die. We met new neighbors, who will very likely become new friends. We met old friends. Lots of people who have known you since you were a baby rode up to check out your art show, to give you hugs, to tell you how proud they are of you. We set out the beginning of a new tradition, which you have already said will be a bit different next year. We’ll invite others to display their art. And we’ll set up an official area where art can be made, live. We’ll have more cookies. We’ll prepare for rain, but be thankful when it stays sunny all day long. And then we’ll take it all down, file your art away safely, and start preparing for another year of collection and inspiration.